Discussion in 'Team OcUK Distributed Computing Projects' started by KingDing, Feb 4, 2013. Oh dear god.... so much win... maybe I should do that with sr-2's if only we could still do it that way..
drool? Back in the day it was cutting edge. 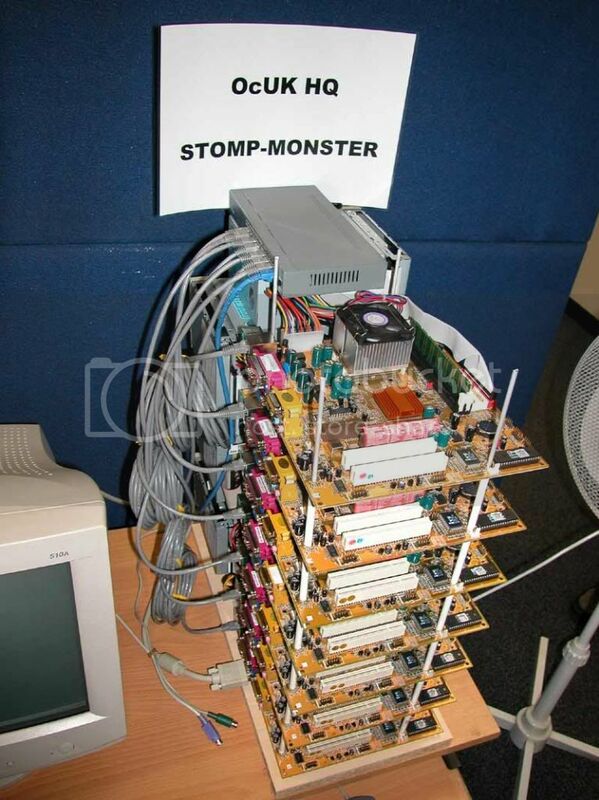 These days I suspect one individual multicored PC stomps the monster. When I win the lottery, im doing it with SR-2s and multiple cards. All watercooled. Work of art that! Ah, memories and the ingenuity...what was the PPD back then so I can laugh? I have room to do that but my fuse box wouldn't cope and the fan noise would bug others. Some folders have borin 2P/4P servers which sadly doesn't include me. I'm sure someone bought stompy, but I can't remember... gettin old. I remember OCUK had to shut it down due to fire risk/insurance. Then magman hosted some or all of it for a while. Not sure what happened then. 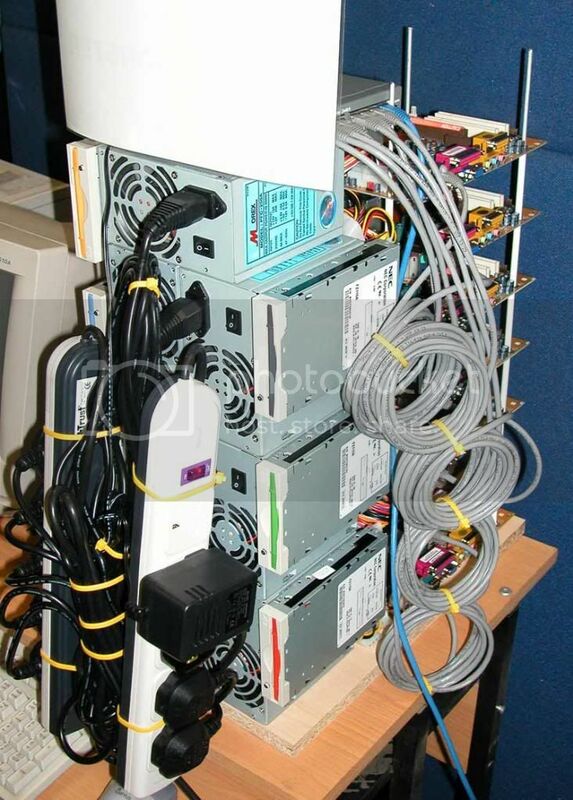 I would assume it got binned once the hardware became redundant, I think it used athlon xp cpus. And why was it built? To crunch seti classic, and help us become the top team in all the world, why were you confused? Spie chucking his toys out of the pram, sounds more like it. What happened with it then? Did anyone get any money back? Each board did about 3 or 4 wu's a day didn't it? Why would we have wanted our money back, we paid for it to run and crunch, which it did for many years when it was no longer viable to do so it stopped, its not like we expected it to last forever, there weren't enough shareholders to pay for its electricity anyway, Spie was paying that, and the insurance costs just got out of hand so it got shut down. A few years later the shareholders decided to split it up and it was hosted by magman and some others, but by then it was way past its sell by date and a single C2Q could put out more wus, and Seti classic became Boinc and then it was just so much scrap. I think at its peak on boinc it put out 1000 RAC. 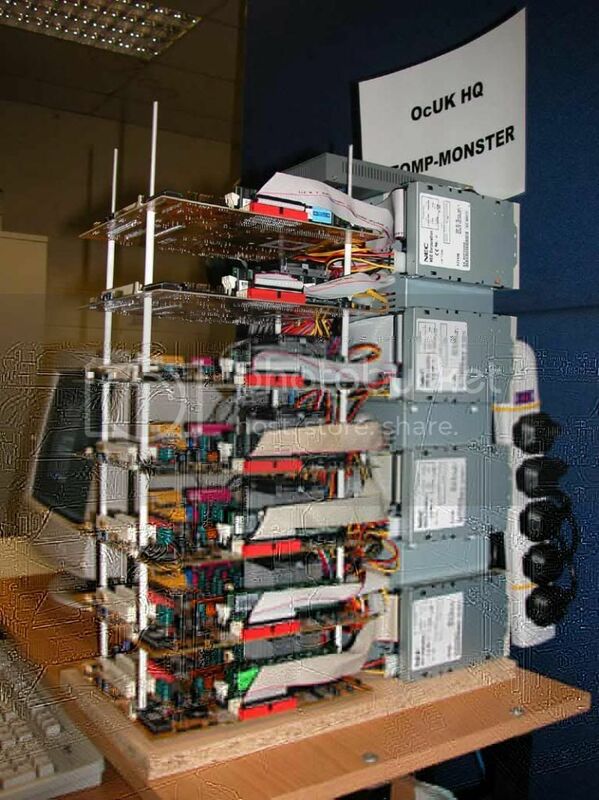 Thats how fast hardware was accellerating past it at the time. It certainly outlasted its own usefullness and we have fond memories of the old dear but I don't think anyone except the most naive would have expected any more that what happened. was this for seti or folding? i see a stomp monster folding username , but also it's been said it was seti? how much did this cost back then? i bet it cost a fortune! I agree too, there are probably quite a lot of people here who would like to contribute to Folding for OcUK but for many reasons can't do it. A simpler way to contribute is to let a couple trusted seasoned folders buy components (discounted?) 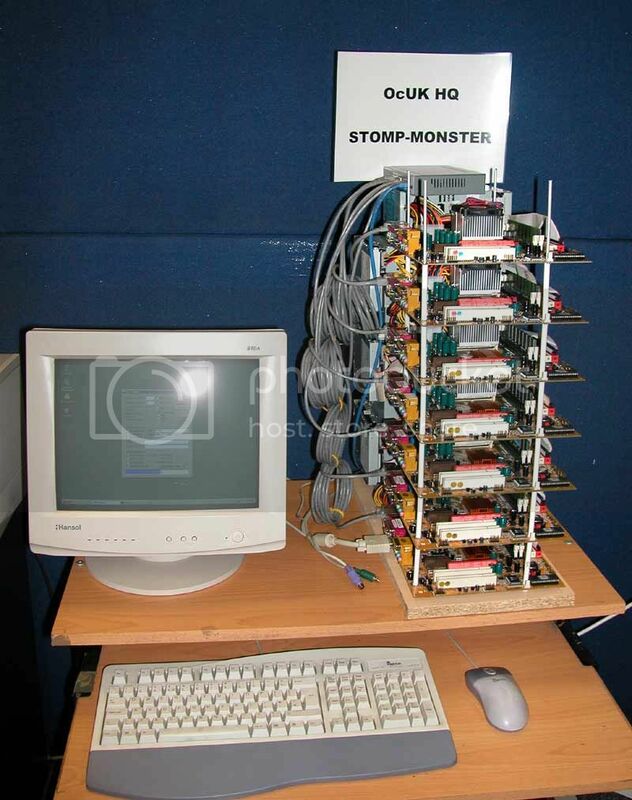 set it all up and maintain it under the username OcUK_StompMonsterV2. 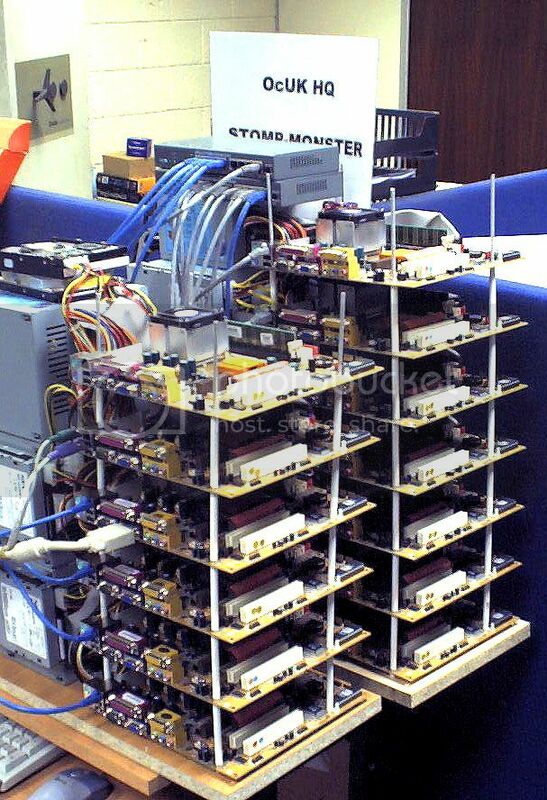 If enough is raised you could buy ie, a decent 2P AMD Opteron server which wouldn't worry insurers than building a skyscraper of boards Not sure how much would need to be set aside for annual running costs, we'll get to that if this happens eh?